Grab your mitts, skates and loved ones for a cozy evening at the Chestermere Winter Lights Festival on November 26! 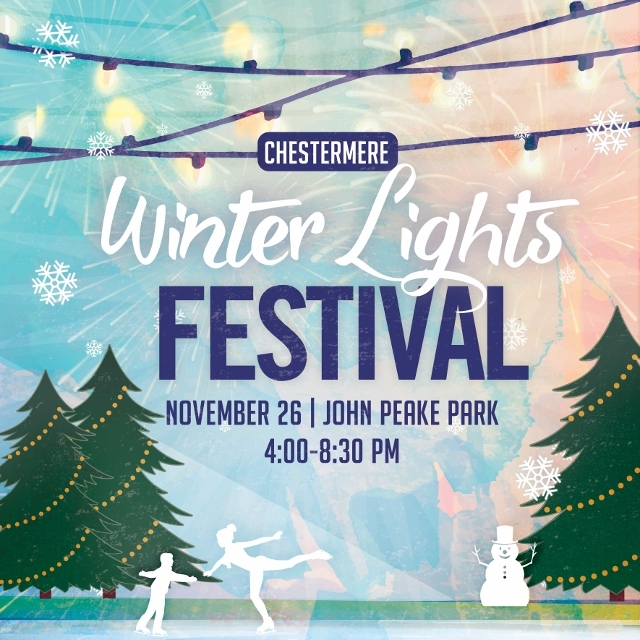 Traditionally a January event, Chestermere’s annual Winterfest has been redeveloped to celebrate the official lighting of the Christmas display in John Peake Park. At 6 p.m. the Christmas lights display will officially be lit to illuminate the community with cheer all through the winter months. The evening will end with fireworks on the lake at 8 p.m.
A full schedule of events for the Winter Lights Festival is available at: www.chestermere.ca/winterlights. Stay up to date with this event on Facebook: www.chestermere.ca/facebook. ⇐Previous Chamber of Commerce to organize 2017 Lemonade DayNext⇒ You can win $1,000 for a youth project of your choice!